One thing that clients never fail to notice when they enter a medical facility is the cleanliness of the premises. Anyone who has needed to take care and manage a medical facility, nevertheless, must know just how much effort is required to meet the cleanliness and sanitation expectations of clients. Outsourcing a medical cleaning service provider betters the overall health of the workplace environment. Professional cleaners understand where and how to disinfect to eliminate germs. They are skilled in preventing contamination. They target and focus most on the sensitive areas to kill the germs to stop diseases before they spread. Well trained medical office cleaners do the job with willingness and a positive attitude. This cleans corners rather than cutting them. 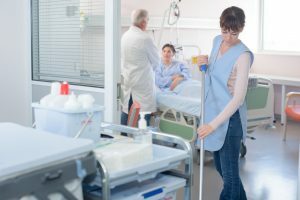 If you are used to asking your receptionist or nurses to clean up, they are likely to do the job in a hurry and poorly so that they can get back to their jobs. Proper cleaning requires concentration, and with professional cleaners, their job is cleaning and maintaining the medical facility. They will clean and disinfect all areas thoroughly. Also, the cleaners are fully trained to meet the compliance of harsh cleaning chemicals. Professional medical facility cleaners pay attention to even the little details. This trait pays itself by making your health facility super clean, and patients will want to keep coming back to the cleanest facility around. It also boosts your employees’ morale due to a healthy working environment. You and your staff will get time to focus on other productive activities like the patients’ health and leave the cleaning task to the professionals. Cleaning by your employees takes a significant amount of time away from the work they were hired to do. There is also the expense of buying the cleaning equipment which will only be good for a few months and will need replacement. Hiring professional janitorial services allows your workers to focus on their projects and you will not need to buy the cleaning equipment. Other than having the knowledge and skills required for proper cleaning, they have advanced cleaning equipment which you may not have if you decide to do cleaning yourself. Even if you can direct your workers on cleaning and give them the disinfectants, they do not have the ability to detect some germs. Janitorial cleaners will not only clean the visible mess but will also get rid of the unseen germs and bacteria. By choosing to use the help of a professional cleaning service, you are leveraging experience, skills and advanced equipment. Consider contacting us at Summit Janitorial and let us offer you the best cleaning services. We have the latest tech equipment to ensure a thorough elimination of germs and our experts are highly trained and experienced.